It’s amazing what we can accomplish during a multi-day power outage. Over the Thanksgiving holiday I learned a few new religious tidbits you may find interesting as well. Several years ago I obtained a copy of Catéchic, “the Catholic trivia game” by Tyco®. While the power was out, I read all 1,000 trivia questions. It proved to be an interesting diversion. The question of whether or not considering trivialities is a waste of time was addressed by C.S. Lewis at the outset of WWII. Lewis’ point is well made. When we contrast the matters which occupy our minds and energies with the things we ignore—including our eternal destiny and whether we are drawing closer to our Creator or drifting farther from him—the things of this world grow dim. Perhaps that will be slightly less true in the case of trivia gleaned from the history of the largest denomination in the Christian Church. A few questions were dated, not surprising I suppose, since the game was copyrighted in 1991. What was surprising is why they would choose to include questions about the names of prominent American archbishops of that decade, knowing it would date the product. Question: Who is the Archbishop of San Antonio, Texas? Comment: He was historic, being the first Roman Catholic bishop of Mexican American heritage, and service as archbishop was lengthy (1979-2004), but the question as posed has passed its expiration date. Name the Native American woman who may soon be canonized. Tekakwitha (1656-1680) was canonized in 2012 and led a tragically short but interesting life. She was an Algonquin-Mohawk, the first Native American to be canonized. Most other questions remain valid. What is the name of Emperor Constantine’s decree that legalized Christianity in the Roman Empire in 313 A.D.? Bravo. As a student of ancient history and a Constantinian numismatist, I am pleased to see this vital moment in church history acknowledged. Was St. Francis of Assisi a priest? Good one! Most of us who’ve studied medieval history would probably get that right, but I assume the majority of Christians (Protestants, Catholic and Orthodox) would likely err on the side of ordaining Francis. Which pope authorized the use of torture during the Inquisition? The irony of his chosen papal name is almost torturous. Admittedly, it was an improvement on his given name, Sinibaldo Fieschi. A fair number of questions about ecclesiastical paraphernalia appear. To advance in the game, it helps to know your patens, piscina, and cinctures from your purificators, pyxes and cruets. Is a “stermutatory” a piece of furniture found in a church? No. A stermutatory is something that makes you sneeze. That said, if some of the pews have grown so musty that they aggravate worshipers’ allergies, wouldn’t they qualify? Some of the trivia provides arcane information sure to surprise one’s peers. What is a cardinal who observers believe may have a chance of becoming pope called? Nice to know . . . Now I just have to think of a way to work that into a typical conversation. Seriously, using a word like this to show off one’s knowledge of obscure things reminds me of a passage I read many years ago attributed to St. Hereticus. * It offers satirical advice on how to upstage others in religious conversations. Opponent: I think my interpretation of the church has full historical precedent in Augustine. Self: Augustine may have said that on one or two occasions, but . . . Opponent (usually an Anglican in this case): . . . leading ideas in Augustine. Self:Augustine may have said that on one or two occasions, but the whole Augustinian tradition, following, as I believe, the essential Augustine himself . . . In this second gambit, it is advisable to maneuver the conversation into a discussion of “the Augustinian tradition” as indicated, so that when Opponent refers to it, as he must, without pronouncing it “the Augustinian tradition,” you can smile deprecatingly, to indicate your point has been made. Well, that is enough trivia for one day. In my next post I’ll discuss some more substantial literary and theological concerns that emerge in the questions. Until then, one final trifle to entertain. What 1975 film tells the story of King Arthur’s search for the Holy Grail as a comedy? * The Collected Writings of St. Hereticus by Robert McAfee Brown. An irreverent look at many aspects of ecumenical life in the mid twentieth century. There is a more positive connection between Monty Python and C.S. Lewis, however. John Cleese recorded The Screwtape Letters in 1995, lending his voice to the devilish “author” of the correspondence. Talk about embarrassing. In a nation that considers God to be its sovereign ruler, it seems rather inexcusable to misspell the name of Jesus. And yet, that’s precisely what the Vatican has done. Even more humbling, the error occurred on a very public medium—the principality’s coinage. And, if that was not enough to generate finger-pointing within the Curia, the coins bearing the defective spelling were minted to celebrate the first anniversary of Francis’ assumption of the papal throne. In actuality, the magnitude of this error was less significant than initially reported. It affected an anniversary medallion, rather than common, everyday coinage that would find its way into the hands of the masses. Also, the mistake was discovered early enough that only a handful of the medals were released; the “lucky” recipients are sure to see the worth of these treasures increase many times over, as their rarity causes the value of the medals to escalate. Unlike Islam, which forbids images of Allah and Muhammad, Christianity has found iconography related to Jesus to be inspirational, throughout its two millennia history. 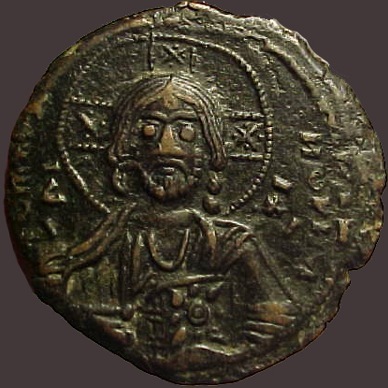 The Lord’s face has appeared on numerous coins throughout the years, and there is an entire series of Byzantine issues that cannot be specifically attributed to individual rulers because they did not include their own likeness or name, preferring to yield their place of honor to Christ. In a 1942 letter to a nun with whom he corresponded, C.S. Lewis shared a poem he had written. 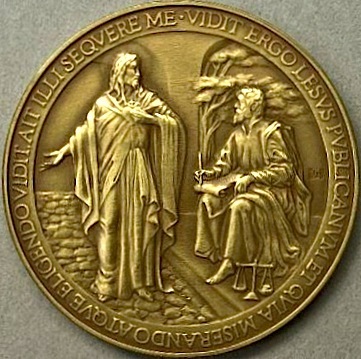 I relate it here because of the exquisite reference to religious portraiture on coinage. Thou, who would’st give no sign, deliver me. Oh thou fair Silence! fall and set me free. Everyone who has ever written something read by others understands the importance of proofreading. This is true for digital media such as emails. It’s even more true for print publications that cannot be easily amended. That said, we can consider ourselves fortunate that our typographical mistakes are not inscribed for all time on precious metals. * Iesus in the nominative case. It’s more commonly seen as Iesu, and my Latin is too rusty to know how it should correctly be rendered in this inscription.